A What's Not To Love About A Fudge Brownie Recipe? This Fudge Brownie Recipe is the answer to all Chocoholics Dreams!! Weekends are saved for baking, and since I'm currently researching brownie recipes, a fudge brownie recipe seemed to be the obvious choice. I needed an easy recipe, simple and tasty. No special ingredients, but things that everyone generally has in their cupboards. After a google search, I browsed through some recipe sites and then some personal cookbooks at home. After looking at so many recipes, it's was only a matter of time before my chocolate craving kicked in. Honesty, I had to act quickly...and so I found my "dream" recipe on Big Oven.com. 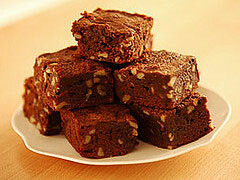 A Double Fudge Brownie Recipe...now doesn't that sound delish? If you've got the time (and the inclination) we hope you'll try this fudge brownie recipe, or better yet, if you've got your own favorite easy brownie recipe, please send it in! We'd love to hear from you! A shout out of "thanks" to Kathy from www.startcooking.com for sharing her photo! Preheat oven to 325°F. Grease a 13x9x2-inch pan. In a small saucepan, combine 1 1/2 cup sugar, 2/3 cup butter, and 1/4 cup water. Bring just to a boil. Remove from heat and add one 12 ounce package (2 cups) semi-sweet chocolate chips and 2 teaspoons vanilla. Stir until chocolate melts. Transfer chocolate mixture to a large bowl. Beat in four eggs, one at a time. In a small bowl combine flour, soda, and salt. Gradually add flour to chocolate batter. Blend in 1 cup chopped nuts if desired. Pour into greased 13x9x2 inch pan.